Scientists in India are targeting enzymes responsible for catalysing the formation of bonds to repair nicks in the phosphodiester backbone of DNA – called DNA ligases – to tackle the ever-growing health concern of multi-drug resistant bacteria, in particular against tuberculosis. 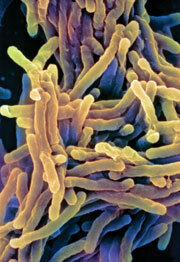 ‘Hydroxamates offer a better chance to develop new economical anti-tuberculosis drugs. The ease of synthesis makes them attractive,’ says Rama Pati Tripathi, part of the team in Lucknow. ‘Developing new small molecule compounds that are able to distinguish between ATP- and NAD+-dependent ligases, such as the compounds presented here, is important for engineering molecules with increased levels of specificity,’ says Rommie Amaro, an expert on enzymological and drug discovery studies at the University of California, Irvine, US. ‘Such specificity is critical for these compounds to be useful from a clinical perspective.’ He adds that the work could help develop compounds that are active against RNA editing ligases. These are potential antiparasitic targets for several of the world’s most devastating diseases, such as Chagas disease and African sleeping sickness.